Its use as a term to label people who produce and sell amazing food serves only to remind us of the fact that, in the UK, such people are still a relative rarity and on the continent, in countries such as Spain, France and Italy, such producers, while respected and admired are not subjected to such silly marketing tags. The producers themselves are not that keen on the term either and, while they may welcome recognition of their work and excellence in prestige and cash, they don’t see themselves as heroes, merely people with a huge passion for what they do. Take two people I met last week at the tail end of my journey in Scotland for EATING FOR BRITAIN, Iain Spink, maker of Arbroath Smokies and Stephen Mitchell of Puddledub Butchers. Both were hugely enthusiastic and dedicated, but it was the food they offered that they wanted to talk about rather than themselves. I met Iain Spink after a long drive South from Cullen. As I walked into the warehouse where the haddock for Arbroath smokies was being processed, Iain was already hard at work, cleaning and tying the fish in preparation for salting and smoking. He had been at it for some time, but there were still hundreds of fish to prepare. So, while he worked he gave me a potted history of the smokie (we both thought having its origins with Nordic traders who settled in the area) and the battle of his father, Robert to gain PGI (Product of Geographical Importance) status for them from the E.U. Iain is the only producer who still smokes his fish over wooden barrels filled with smouldering hard beech and oak wood and he spends weekends taking his hand built rig around the farmer’s markets of Fife and some of Scotland’s many Highland games selling his fish “hot off the fire” to an increasingly willing public. After an enjoyable morning and a lunch where I sampled my first smokie in Arbroath at a local pub (not one of his, but a decent example he declared) we made plans to meet two days later at the Kirkcaldy farmer’s market where I would be able to see him in action. He also persuaded me to take a detour to Forfar to sample another local delicacy, The Forfar Bridie. Akin to a Cornish pasty, the Bridies were hot out of the oven when I walked into Saddler’s Bakery, their spiritual home. They too are after PGI status for their dish, but unfortunately no one can seem to agree if they should be made with short crust or flaky pastry, so have not got very far. I sampled one of each, and can say for the record that short crust is the way to go. After a slightly depressing night in Arbroath where the chill winds were howling through the town off the sea and the thought of a pint of McEwan’s heavy in an unwelcoming pub followed by a kebab did not appeal, I was pleased to point my car South again towards Kirkcaldy. En route I made a stop at a small, grim village called Kenaway. There would be no reason to ever stop there if it were not for the slightly unlikely presence of one of the best butchers you are ever likely to see, S. Mitchell at Puddledub. Stephen Mitchell is frighteningly young and already carving (sorry!) out quite a name for himself for the quality of the beef and lamb he sells. But, it was not that which was of interest, it was the fact that Stephen also raises and sells Buffalo as a healthy alternative to beef and has won a plethora of awards for his unusual product. After a happy half hour chatting to Stephen and an even more happy half hour watching his butchers cut meat and make sausages, I headed off to my B&B in Kirkcaldy and, after dumping my bags, set out to find something for supper. It was at this point that the true dichotomy of eating in Scotland hit me. One the one hand I had spent time over the last week with producers of some extraordinary foods, producers of haggis, pies and oatcakes alongside eating some of the best beef and seafood I have ever tasted. Yet, as I trudged along Kirkcaldy High St at 7pm on a damp, cold evening, none of it was on offer. 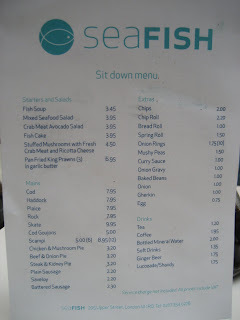 There were eight, yes eight Indian restaurants, the usual Chinese take-away, a Thai restaurant and even a Polish deli, but there was not a sign of Scotland in any of them except the obligatory fish & chip shop, and even I could not face another fish supper. I couldn’t even get a decent drink with every grim pub filled with people drinking 99p pints of Carling Extra Cold. I just couldn’t do it, so slunk back to my guesthouse, made a cup of tea and caught up with my writing. The next morning, as I walked towards the bus station, opposite which the farmers market was held, I could already see whisps of smoke in the air and I arrived to see Iain and his two helpers, Jim and Holly hard at work hooking the fish on staves and stoking the embers of the already smouldering fire. Iain was laying the first fish, trout as well as haddock, over the barrels and covering them with dampened hessian sacks to make sure the smoke did not escape. Then it was my turn. Iain cut open a smokie and laid it out for me to pick at. It is hard to describe just how good an Arbroath Smokie tastes and, unless you travel up to Scotland, you will never get one from Iain Spink. The oils from the fish glisten on the flaked flesh and the smoke flavour is subtle. I can say now, even after travelling the globe, this is one of my top ten tastes of all time. Add to that the hot smoked trout and I was glad that I had passed up the opportunity of a cooked breakfast at my guesthouse that morning. Iain smiled as I made loud slurping noises as I ate and wrapped up some for me to take away. By 11am, it was time to head back to Rotherham for a night or two before the next stage of the journey. I stopped by to say hi to Stephen Mitchell who was also at the market and made many appreciative noises when he handed me a bag of goodies to sample. Then it was time to go. It’s a long drive and, turning down the chance to listen to “wossy” on the radio, I began to think about what I had experienced in Scotland. Incredible friendliness, great B&B’s, wonderful food produced by dedicated people and a population who, on the whole, didn’t give a crap and were prepared to eat and drink junk as long as it was cheap. "John Knox has a lot to answer for"
I meet amazing, curious and crazy people as I travel around, but few have been as beguilingly barking as my new chum, Rhidian. I was put in touch with him by Henrietta Lovell, of The Rare Tea Company, who explained that he often took his obsession with food to ridiculous levels. After one short day in his company, I can see what she means, hanging with Rhidian is a dangerous business. He reminded me of a character from Wallace & Grommit, with unbounded and infectious enthusiasm for everything and everybody, particularly food and food people. His first sage advice was to have a light breakfast at my guesthouse and I soon began to understand why after I met him as planned opposite The Balmoral Hotel on Princes Street and he began to outline his challenging food itinerary for the day. First up, second breakfast at a small, unassuming café called Embo where, while Rhidian broke open a decent looking wrap, I found room for a large portion of scrambled eggs and local smoked trout on honey bread. Next up, one of the highlights of the day, indeed one of the highlights of any number of days. Rhidian took me to meet his chum Mark who runs George Bowers, one of Edinburgh’s top game butchers. Rhidian, it transpired knew everyone there well and would often pop in to help in busy times in return for being taught the skills of a master butcher. This shop is the real deal. A huge chill room filled with ageing beef, game birds waiting to be plucked and butchers of years standing, cutting and trimming with uncanny precision. Rhidian had persuaded Mark not only to show me how they made their haggis, but also to allow me to create my own Chieftain O’ The Pudding Race. In a large steamer, the carcasses of trimmed game were being boiled to make a deep stock whose gamey fumes filled the air. In a pan, Mark mixed this with the classic ingredients for the haggis, heart, lung, liver and fat. He cooked them off for a short while before mincing with fresh onions and then adding the spices (lots of white pepper, I reckon) and pinhead oatmeal and then it was my turn as I was instructed to rinse off the salted ox stomach used for the casing and then, using the sausage machine, to make a haggis of my very own. Well, despite the laughter from the assembled, gnarly faced old butchers, I thought I did a rather splendid job and was pleased as punch when Mark wrapped my creation up for me and added to it a fresh Scotch pie for extra measure. After a quick stop at Luca, one of Edinburgh’s most famous ice cream shops, I was surprised when Rhidian slotted his car into a small space in front of what appeared to be a very ordinary looking Chinese restaurant. Rhidian, as I was realising, doesn’t do ordinary and assured me that I was in for a treat. Chop Chop, run by Chinese chef Jian and her English husband, Roy specialises in dumplings from the Northern East regions of China and, under their guidance the staff presented us with plate after plate of juicy, succulent dumplings both boiled and lightly fried. Alongside these came simple yet flavour packed side dishes of green beans and a particularly stunning plate of aubergine in garlic and chilli. Chop Chop already has great reviews in Scotland and recently came second to the famed Manchester restaurant Yang Sing in a major competition sponsored by Tsing Tao. One can’t help thinking that any broadsheet reviewer willing to eat outside Fulham and head to Morningside, might just be on to a real winner. I can safely say that, if Chop Chop were in London, it would be as busy as Tayyabs. That’s how good it is. Next stop was one of my organising, a chance to meet with the good people of MacSween’s haggis. Unfortunately, they are a bit iffy about pictures being taken in the factory, so I don’t have anything to show for a fascinating and hugely enjoyable two hour visit with James and Jo MacSween, but what interested myself and Rhidian, who joined me, most was the similarity in enthusiasm between them and Mark at George Bowers. MacSween may be making tonnes more of the things, but their passion for what they are doing was obvious and their generosity likewise as they plied us with goodie bags to take away. Rhidian had plans to finish me off with not one but two classic Scottish fish suppers. Unfortunately, after the first, at The Cadora Café, just across The Forth Road Bridge, I was spent. Rhidian had beaten me and, despite his cries of “lightweight” the savoury sweat oozing from my brow told me that I should probably call it quits and head to my next guesthouse. So, after following him back to his house to borrow a cool bag to store my haul for the day, I headed off through the winding unlit lanes of Fife in the direction of the village of Pittenweem, where I would be spending the night mainlining Zantac. I am already planning a rematch with Rhidian next time he comes to London. The bugger wont know what hit him. In truth it wasn’t the best time to visit a Fish and Chip shop. 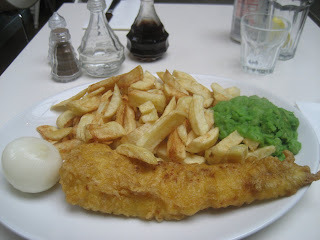 Feeling tired, crotchety and nursing a hangover I could only be placated by a good plate of something deep fried. Sadly, Seafish (I wonder if there’s a sister restaurant, Fieldcow) didn’t oblige and I left full of useless carbs, all my woes still intact. It had looked so promising the previous evening. I’d just visited Public House, a cocktail bar, just off Upper Street and understated enough to mean the hordes marching up and down the main drag passed it by. I’d had a couple of drinks: a Dry Martini and a Manhattan. Both were well made with decent liquor. They were strong and at around the seven quid mark not too expensive. 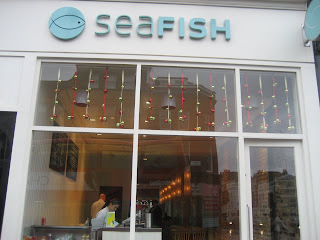 Wandering back down towards the tube I passed Seafish. It used to be an old-style chippy but I’d never seen many people in there. Now it was full and buzzing. There were candles on the table and there was a big sign outside exhorting the punters to come in and BYO. All good stuff and about time too given that the last decent chippy in this area – the Upper Street Fish Shop – closed some years ago. The next day, however, it seemed everyone was nursing a collective hangover. The Eastern European staff were incredibly taciturn, the fry master didn’t look too happy either. Unhappy people produce unhappy food. 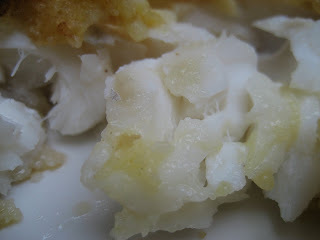 My Haddock was soft and overcooked. The batter lacked any crispness and was as tired as my face. Mushy Peas had an unappealing crust on them. Worst of all were the Chips which had that slightly rancid taste of old oil which I got to enjoy throughout the afternoon. I may never eat chips again. A run-of-the-mill pickled onion was cheekily pushed out at one quid. Although the prices appear reasonable the bill can still surprise if you add on a few extras and given the poor quality of everything it brought to mind the saying that Bad Food Is Never Cheap. There’s no art to making Fish and Chips. It’s something that, when you have a bit of experience and some good ingredients, should be eminently reproducible day in, day out. 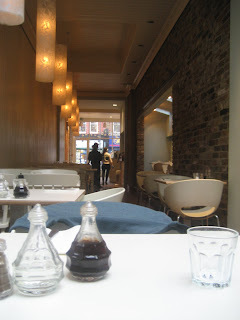 Seafish didn’t seem to have the necessary cooking chops to do even one service of decent food and only adds to the woeful lack of good dining opportunities on Upper Street.